These muffins are just proof that if you want something but you can’t find a healthy version, make it yourself. Preheat oven to 375 degrees. Coat 12 standard muffin cups with cooking spray, or, if using paper liners, spray liners lightly with cooking spray. Whisk the dry ingredients: the Bisquick and the Truvia, and set aside. Whisk together applesauce, buttermilk, eggs, oil, and vanilla in a large bowl. Add the dry ingredients and fold them in just until combined. Carefully fold in blueberries. Pour batter into the muffin cups, making sure to fill each to the brim. Bake 25-30 minutes, or until a toothpick inserted comes out clean. 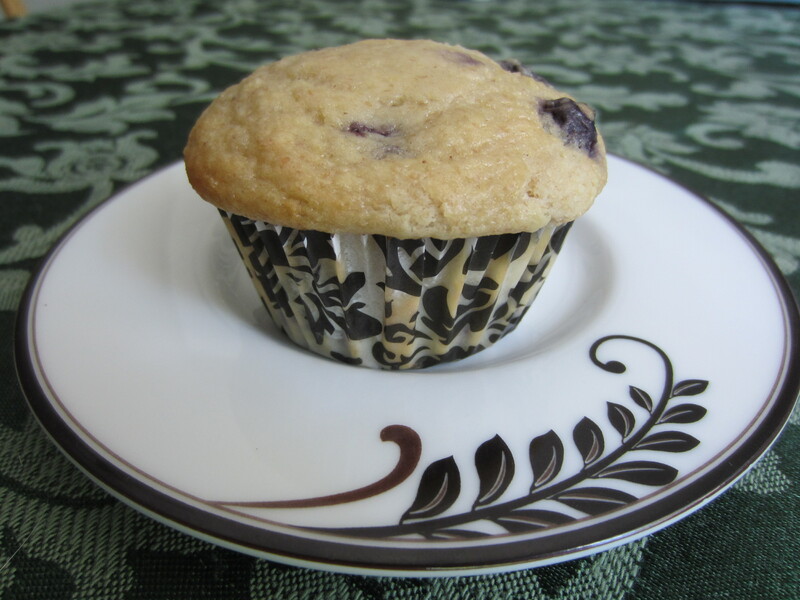 Jenny Craig: Ideally, you should have 1½ muffins for breakfast. Most Jenny breakfasts run at about 2 Starch and closer to 200 calories. Weight Watchers: 3 Points (using calculatorcat.com). Dude, a standard sized muffin at 133 calories with only 3 ½ fat grams? I challenge you to find a store bought muffin with those stats…it has to taste good too. A note on the prep work: if you’re using paper liners, spray them with something! I forgot to do this, and thus lost about ⅓ of my muffins to the paper. Very disappointing, since I counted the whole muffin towards my day. Honestly, you could probably cut the calories down even more. If you can find fat free buttermilk, that would work (I couldn’t though…believe me, I looked). It must exist because I’ve seen it in recipes. I used flax meal in this recipe because it’s heart healthy and is a great way to cut back on some of the fat. There are a lot of studies on the benefits of flax seed happening right now, but what research is suggesting is that it affects the way your body handles estrogen. It may reduce the risk of breast cancer and help your body cope with menopause. It’s also a main ingredient in a lot of breast milk boosting products. Plus, it adds protein, fiber, magnesium, and thiamin to our muffins. Then there’s the coconut oil. I’ve read a bunch of different articles on the numerous benefits of coconut oil. It does have more saturated fat than other oils, but apparently the type of saturated fat may protect against infection, boost thyroid function, and promote weight loss. You don’t want to use a lot of coconut oil, just like any other oil, and you want to get the least processed version so it has the most nutrients. I started using it because my mother-in-law and grandmother-in-law did some research and found that it helps repair your memory. There are people out there who slowed or even slightly reversed Alzheimer’s with this stuff. For a mom whose memory is constantly at a loss– bring it on! Looks yummy! I know that there’s a way to substitute for buttermilk using one cup of “normal” milk and a tablespoon of vinegar (you let it sit a couple minutes, then use what you need)–I wonder if you could make “fake lowfat buttermilk” that way? Hmm…that’s an excellent idea. I’m going to have to give that a try. I assume we’re talking about white vinegar, correct?